In the end, I think it’s a good thing, and here’s why: People make mistakes. 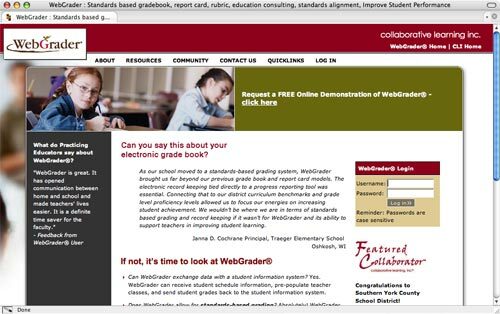 My daughter is a good student, but she was a bit overwhelmed by middle school, so the first time I logged into WebGrader, I saw an F, and there was a note from a teacher about a missing assignment. I asked my daughter about it and she said she turned it in. I sent the teacher a message asking her to discuss it with my daughter, and it turns out it was turned in, but with no name on it. Simple mistake. The next week I saw another F and when questioned, my daughter said she handed it in, and got it back – with an A on it. A simple message to the teacher revealed that the grade was entered wrong, and was indeed an A. Again, a simple mistake, but one I am glad I could catch. Posted on Tuesday, October 2nd, 2007 at 12:30 pm. Subscribe to the comments feed. Both comments and pings are currently closed. Post on your own blog.